A large flock of blackbirds. During the fall it is common to see several different blackbird and blackbird-like species flocking together—the Red-winged Blackbird (Agelaius phoeniceus), Rusty Blackbird (Euphagus carolinus), Common Grackle (Quiscalus quiscula), Brown-headed Cowbird (Molothrus ater), European Starling (Sturnus vulgaris), and occasionally Brewer’s Blackbird (Euphagus cyanocephalus) or Yellow-headed Blackbird (Xanthocephalus xanthocephalus). Red-winged Blackbird: The first of the songbird migrants each spring, red-winged blackbirds return to Illinois in late January or early February and stay until early December. They are common and abundant throughout the state, and some overwinter here, mainly in southern Illinois. Rusty Blackbird: The rusty blackbird is a spring and fall migrant. Those that visit Illinois come through from mid-February through late April and again from late September to late November. They are an uncommon to locally abundant winter resident in a few locations throughout the state, though the numbers decrease going northward. Common Grackle: In southern Illinois the Common grackle is an abundant year-round resident. In central and northern Illinois they arrive in mid- to late-February and leave by late November. They are common to abundant in these parts of the state during the warmer months and a rare winter resident. Brown-headed Cowbird: The Brown-headed cowbird migrates to Illinois in late February and leaves by late November in central and northern Illinois. In southern Illinois they are common throughout the year. Brewer’s Blackbird: The Brewer’s blackbird is an uncommon spring and fall migrant. Those that visit Illinois arrive in late February and leave by mid-April and come through the state again from early October through mid-November. They are a very rare winter resident. Yellow-headed Blackbird: This migrant arrives in Illinois in early to mid-April, the breeding pairs typically are gone by August and the remaining birds tend to leave by mid-September. In the past, the yellow-headed blackbird was more common and widespread, but they are now listed as a state endangered species. In the spring and especially in the fall, blackbirds and blackbird-like species often travel in large mixed flocks. During the spring these flocks are typically smaller and the birds quickly set up breeding territories and pair off to raise their young. 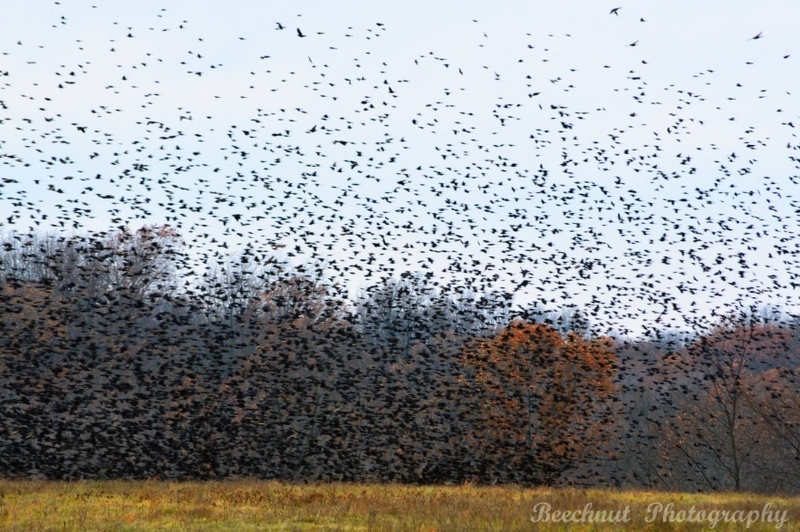 In the fall it is possible in some locations to see flocks with hundreds of thousands of birds gathered together. Blackbird eggs and young, and occasionally the incubating females, are eaten by snakes, raccoons, foxes and other predators. Adults are taken by hawks and many mammalian predators. In large roosts, the excrement from the birds can be cause for concern since it can contain Salmonella and E. coli, two pathogens that can cause illness in people and livestock. Blackbirds can also pose a serious danger at airports and military bases when they are involved in bird-aircraft strikes. 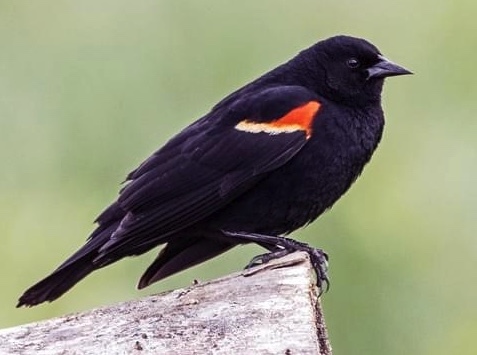 Red-winged blackbirds can be found in marshes, wet meadows, along roadsides, shorelines and in agricultural and fallow fields. Rusty blackbirds use swampy areas and wet woodlands and agricultural fields. 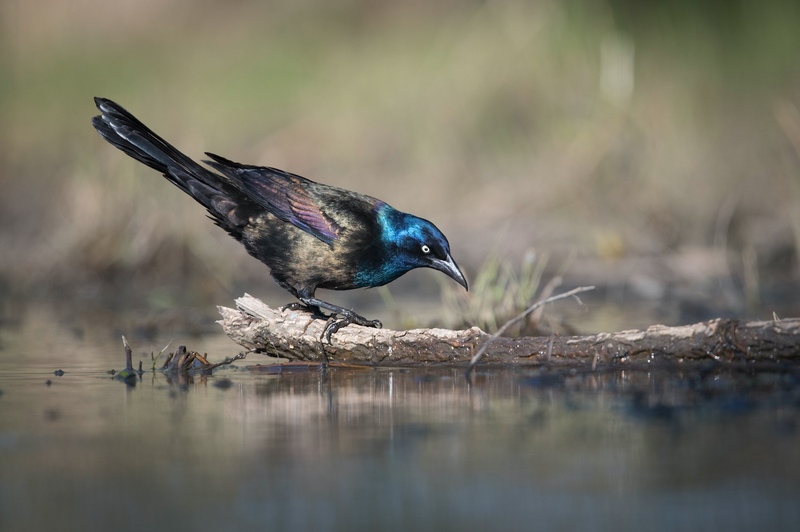 Common grackles are found in many habitats including wetlands, agricultural fields, woodlands, and urban and suburban areas. Brown-headed cowbirds use agricultural and residential areas and are often found near livestock facilities. Brewer’s blackbirds tend to be found in grassy meadows, open shrublands and sod farms. Yellow-headed blackbirds prefer deep, permanent hemi-marshes with tall vegetation. Blackbirds, grackles, and cowbirds eat various species of insects, spiders, worms, snails, salamanders, small snakes or lizards, fruit, seeds, grain and waste grain. Red-winged blackbirds produce three to four eggs laid in a grass nest built in tall grasses or flowering plants. Only the female incubates the young. Rusty blackbirds do nest breed in Illinois. Common grackles produce four to five eggs laid in a nest built in woody vegetation and made out of twigs, grasses and mud. Only the female incubates the eggs. Brown-headed cowbirds are nest parasites, laying their eggs in the nests of other species. Each female lays 40 or more eggs a year. The cowbird eggs hatch before the host eggs, giving them a serious competitive advantage over the host’s own young. Brewer’s blackbirds nest in small colonies. They build nests of grasses and mud on the ground, or in shrubs or small trees. They lay four to six eggs which the female incubates. Yellow-headed blackbirds nest near to each other in hemi-marshes. The females build bulky nests of aquatic plants lined with dry vegetation that they weave into cattails, reeds or similar vegetation suspended over the water. Common Grackles can be identified by their iridescent blue heads. For all of these species, most of the young do not survive the nesting stage. Those that do survive the juvenile stage and make it to adulthood will live about a year to three years. 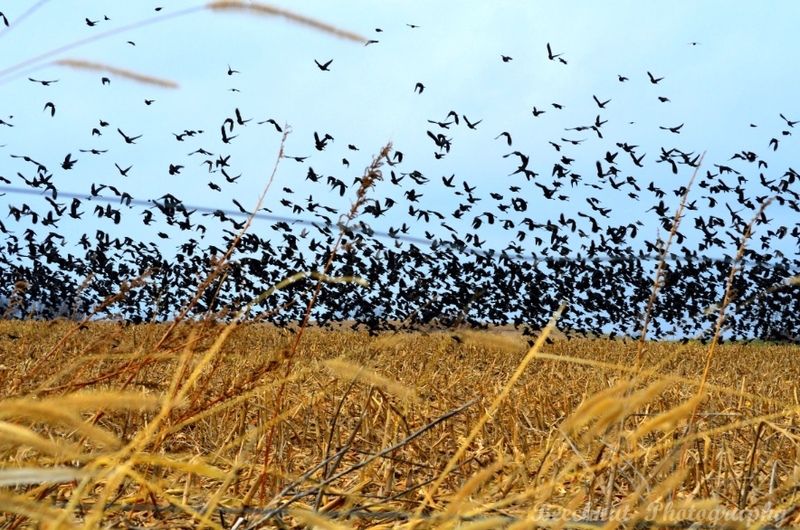 Damage in agricultural fields caused by blackbirds is usually easy to identify since the flocks of birds are highly visible. However, birds seen in the fields may not be the ones damaging the crops. Damage depends on the species and the development stage of the crops. For example, European starlings in fields typically are there to eat insects such as armyworms and do not do much damage to corn. Red-winged blackbirds will eat a lot of rootworm beetles in corn fields, but can cause a lot of damage to the corn during the milk stage. Damage is sometimes attributed to blackbirds when it is actually caused by deer, raccoons or squirrels. Blackbirds tend to slit or shred corn husks and peck out the inside of the kernels, but they leave the kernel coats, which turn black. Mammals will chew through the husk and bite the kernels off. Looking at the base of the plants can help with identification—birds often leave droppings and mammals will leave paw prints if the ground is not too dry. The USDA-APHIS-Wildlife Services has put together easy-to-read technical reports that provide blackbird damage prevention and control measures as well as bird dispersal techniques. These resources provide suggestions on habitat removal, exclusion, repellents, frightening devices, toxicants and removal. If you need help with blackbirds, CONTACT your local Illinois Department of Natural Resources district wildlife biologist. In Illinois, Red-winged blackbirds, Rusty blackbirds, Common grackles, Brown-headed cowbirds, Brewer’s blackbirds, and Yellow-headed blackbirds are all protected by the Illinois Wildlife Code and federally protected by the Migratory Bird Treaty Act. The Yellow-headed blackbird is also list as an endangered species in Illinois. None of these birds, their eggs, young, or active nests may be removed without a permit. If you need help with blackbirds, CONTACT your local Illinois Department of Natural Resources district wildlife biologist.